One of the more satisfying things you can do when cooking food from another culture is making some of the basic preparations that you would otherwise buy. 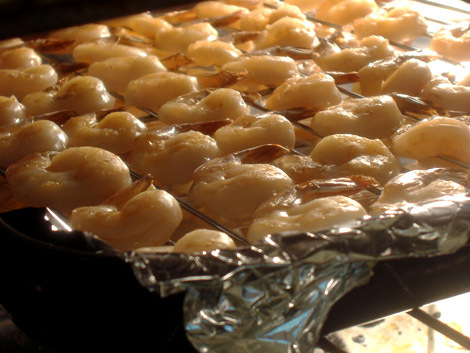 SE Asian cuisines in particular have a broad range of interesting things to do with seafood. In order to preserve them, fish and shellfish are dried, pickled, fermented, or some processed with combination of methods. 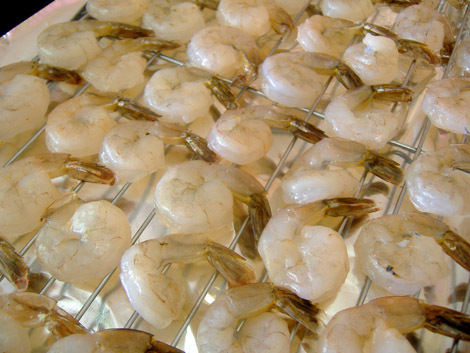 The delicate flavor of fresh seafood is lost during these processes, but other interesting and worthwhile flavors are introduced as a side effect of the need to put food aside for the times when it is not so abundant. First, brine. 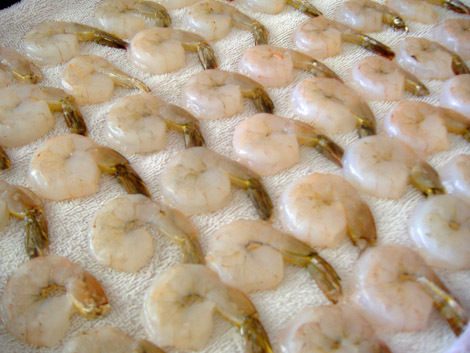 I wanted to start on the path to seafood charcuterie in the easiest way possible: drying some shrimp. Charcuterie is a French term that means literally 'cooked meat.' Cooking is a chemical process and these preservation processes can be considered a form of cooking. 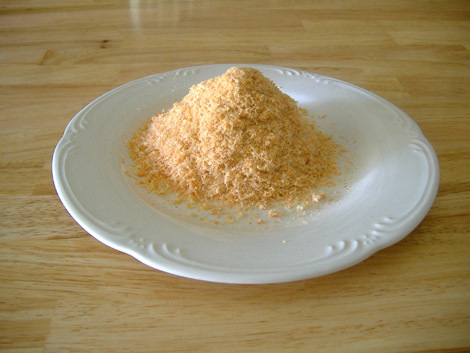 Shrimp powder is a common ingredient in Thai cooking, and is yet another way to add the deep oceanic taste to dishes that is characteristic of the cuisine. 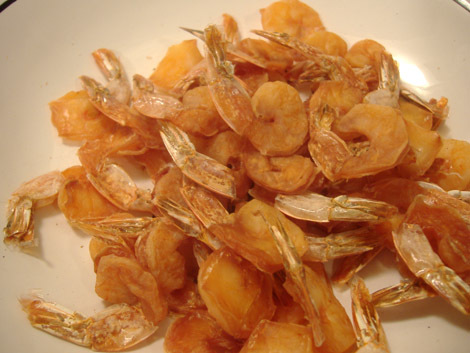 I started by brining some shrimp in a salt and sugar solution overnight. The typical ratio is a gallon of water to a cup of kosher salt, with varying amounts of sugar depending on what you are making. I dried them off, deveined them, and put them on a rack to go into the oven. Next, dry. 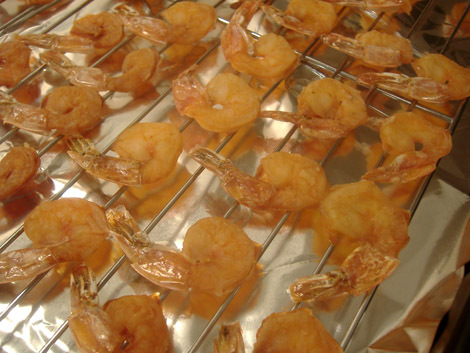 I dried the shrimp in a low oven (below 200) for most of the day, checking on them from time to time. Had I pulled them out a little earlier, I would have had something more like the slightly moist whole little dried shrimp sold in Asian markets. I already have some of those, and anyway I was going for dried shrimp powder, so I left them in until most all of their moisture was gone, making them easier to grind. Last, grind. At the end I had some very dessicated shrimps. 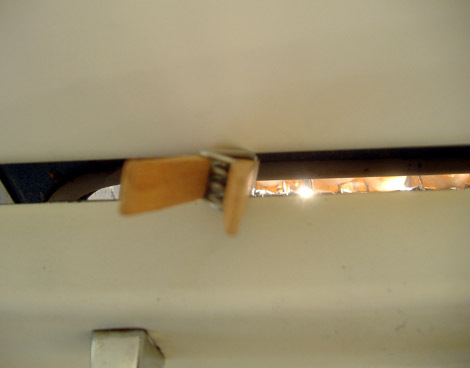 I’m not sure why I had left the tails on, but I took those off and then ground them up in a spice grinder. What I ended up with was a fluffy powder that has a salty, shrimpy, and slightly bacon-y flavor from the long warm drying process. It has none of the fishfood smell that store-bought shrimp powder can have, even though the store-bought stuff doesn't taste like that. Almost ready to make that salad.